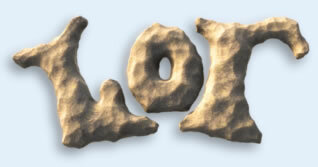 "LOR" the movie is an animated tale of creation. Billions of years ago a strange being lands on a young planet and sets up shop with a plan to cover the world with life. His name is LOR. This movie will eventually be a feature length event, all created by one artist, me... Andy Murdock. All the animation, characters and music are created right in my home. This is a massive undertaking for one person and that is why I'm creating "LOR" one segment at a time. Each year, in my spare time, I burn the midnight hours away creating new characters, animating and composing the music that all go into the final piece. For me this is a labor of love. For years I worked at animation companies, pleading and lobbying for permission to make animated shorts and films. There always seemed to be some junior executive who made it their job to say NO to good ideas and yes to bad ideas. So my motto is "Don't ask permission to follow your dreams." That is the most important thing that I have learned from all my experiences in the entertainment business. So with a little bit of money I saved up, I bought my own computer animation systems and software and started up my own animation business called "Lots of Robots" and started making my animated story and doing contract animation and sound design.